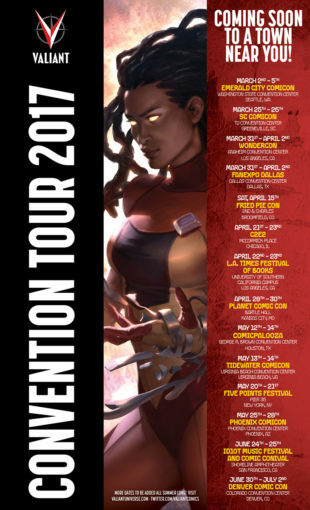 This year, the hardest touring company in comics is upping the stakes with more dates, more conventions, and more opportunities to meet your favorite creators than ever before! Next stop: The entire Valiant team is heading to Greenville, SC for SC Comicon 2017! From Saturday, March 25th to Sunday, March 26th, get up close and personal with Valiant’s brightest stars at the TD Convention Center for an action-packed weekend bursting with exclusive releases, special guests, panels, and more! Swing by the Valiant booth all weekend long, and dive into the most acclaimed superhero universe in comics with a complete collection of trade paperbacks and hardcovers featuring Valiant’s critically acclaimed line of titles, including BLOODSHOT REBORN, BRITANNIA, DIVINITY, FAITH, NINJAK, X-O MANOWAR, and more! Then, prepare for war as Valiant teams up with Greenville’s own Borderlands Comics & Games for the X-O MANOWAR #1 BORDERLANDS EXCLUSIVE VARIANT, featuring the raw pencil artwork of explosive artist and SC Comicon special guest Lewis LaRosa (Bloodshot Reborn)! The year’s biggest superhero sci-fi epic begins here with the FIRST ISSUE of the EPIC NEW ONGOING SERIES from New York Times best-selling writer Matt Kindt (Divinity, Mind MGMT) and Valiant-exclusive rising star Tomas Giorello (Bloodshot Reborn, Batman and Robin) that will push Aric of Dacia beyond the farthest limits of our galaxy…and into the brutal opening salvo of the ultimate X-O Manowar tale ever told! Available only at the Borderlands Comics & Games booth! Plus: Valiant is offering portfolio reviews for aspiring artists all weekend long! Have Valiant’s acclaimed editorial team review your work and give you the inside track on what it takes to make it in comics. Individual portfolios reviewed on a first-come, first-serve basis. Then: Celebrate the silver anniversary of Valiant’s number-one hero at the VALIANT: 25 YEARS OF X-O MANOWAR panel presentation on Saturday, March 25th! This March, Valiant celebrates 25 years of its most enduring comic book icon as best-selling writer Matt Kindt and a rotating cast of powerhouse interior artists launch a stunning new beginning in the all-new X-O MANOWAR #1! Now, right here at SCCC, join a blockbuster roundtable of Valiant’s greatest talents for an in-depth discussion of X-O Manowar’s landmark place in comics history…and a special look forward at the must-read new series of 2017! Finally: Witness the future that lies ahead for your favorite heroes and antagonists with VALIANT: THE ROAD TO HARBINGER WARS 2 panel presentation on Sunday, March 26th! The road to Valiant’s biggest, most ambitious and most impactful comic book event of all time starts right here at SCCC with a superstar cast of Valiant creators and staff! Jump on board here to find out what the future holds for HARBINGER RENEGADE, X-O MANOWAR, BLOODSHOT, FAITH, DIVINITY, NINJAK, and the rest of Valiant’s most powerful heroes…and how the coming of HARBINGER WARS 2 will soon be felt across the entire Valiant Universe with all-new news and artwork! We’ll see you in the Palmetto State!